Brain barometer: Enhanced connectivity within a motor brain network accompanies severe autism traits. Some links between sensory and motor brain networks are unusually weak in individuals with autism, according to a new study1. Other connections are enhanced, however, and their strength tracks with the severity of autism traits. The findings point to a possible neurological basis for sensory and motor problems in autism. Experts once considered sensory and motor problems, such as hypersensitivity to sound or an awkward gait, to be only secondary traits of autism. But mounting evidence suggests that such traits play a central role in the condition. “Our findings are fully consistent with the relevance of these sensory symptoms and also with the relevance of the sensory and motor networks,” says lead investigator Jan Buitelaar, professor of child and adolescent psychiatry at Radboud University in the Netherlands. The results also jibe with work showing that interactions between visual and motor regions of the brain are out of sync in autism. The study provides “some support for the hypothesis that decreased visual-motor integration may be a feature of autism,” says Stewart Mostofsky, director of the Center for Neurodevelopmental and Imaging Research at the Kennedy Krieger Institute in Baltimore, Maryland, who was not involved in the work. The new work analyzes brain scans from nearly 500 people and represents the first wave of data from an offshoot of the European Autism Interventions – A Multicentre Study for Developing New Medications (EU-AIMS). That massive project aims to identify subtypes of autism and biomarkers of the condition. The large sample is a strength of the study, says Ralph-Axel Müller, professor of psychology at San Diego State University in California, who was not involved in the study. “Obviously the literature is filled with papers that were based on very small samples, and that’s always a problem because we know that there are probably lots of different biological subtypes in [autism],” he says. 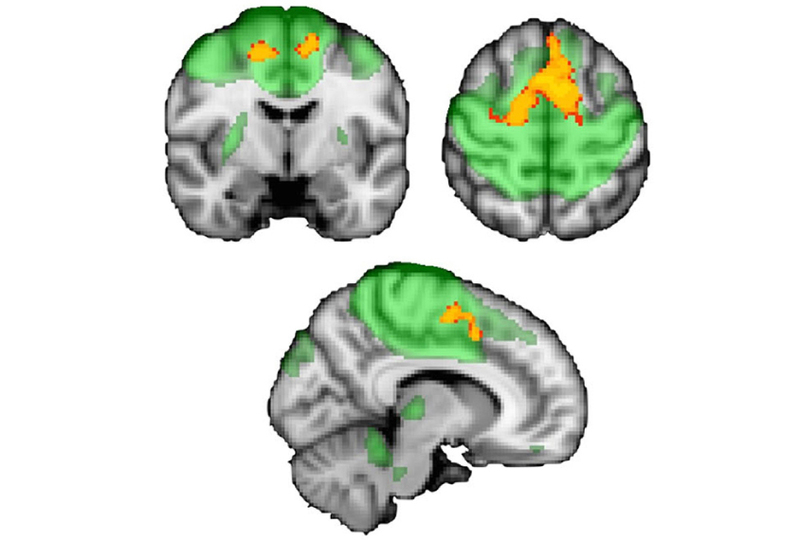 Buitelaar’s team analyzed brain scans from 265 autistic people and 213 controls, aged 6 to 30 years. They captured the images while the participants rested in a scanner. The researchers found no differences between the two groups within any of the 20 brain networks. However, the networks that govern vision, touch and motor skills interact less with each other in the autistic participants than they do in controls, the researchers found. By contrast, communication between these networks and the cerebellum, which plays a role in both motor coordination and cognition, is more robust in autistic participants than it is in controls. This suggests that the “functional architecture of the brain,” particularly as it relates to how different brain systems interact, is different in autistic people than in controls, Buitelaar says. The findings contradict others suggesting that autism brains show atypical connectivity within several brain networks. It’s possible that the wide age range of the participants washed out some of these group differences, Müller says. The researchers may also have missed granular differences between the two groups because they looked at large networks as single units, even though each one houses several regions with diverse functions. A disruption in connectivity between sensory and motor networks could have widespread effects. For instance, developing social skills involves modeling others’ behavior, which requires watching them and imitating their actions, Mostofsky says. In line with this reasoning, the strength of connections between the cerebellum and the touch and motor networks tracks with the severity of the participants’ autism traits, as measured by the Social Responsiveness Scale. The same is true for connectivity within three of the networks — those governing attention, decision-making and motor skills. The stronger the connectivity, the more pronounced the autism severity. Buitelaar’s team plans to explore whether sensory and motor connectivity patterns can be used to identify subtypes of autism.